Now that the Microsoft year-end is behind, many of us will be going on summer holidays. One thing you might want to do before you go away is book a place at the Dynamics autumn conferences as when you get back from your break the registration fees might have gone up or they might even be sold out…..the early bird offers are often worth it. eXtremeCRM is 100% focused on Microsoft Dynamics CRM with tracks for each role within your organization. The conference is independently run by eXtreme, who deliver community-based events and activities. Microsoft Dynamics CRM consultants, partners and end-users from all over the world come together to network and find new opportunities to work together. Attendees will gain knowledge from real-world experiences and dive deep into current and future technologies. There are different tracks for Product Development, Marketing, Sales, Consultants, Sales Engineers & Developers and Training Academy. In addition, there is an Exec Summit & Exec Exchange for the senior managers. Pricing: $995-$1,895 depending on how early you register and which track you attend. The same time as eXtremeCRM….spoilt for choice! DirectionsEMEA is run by an independent community of Dynamics NAV partners. Their aim is to help build a stronger and more engaged Dynamics NAV channel community and enhance the NAV Partner communications & relationship with Microsoft. The Directions Conference sessions have something for everyone at each level of expertise from within a partner firm: Developers will gain technical knowledge; Implementers will gain project management expertise; Sales people will learn strategic selling tips and share what works on the front line; Executives will be inspired to run their company even more successfully. Perfectly timed so you can fly from the above events to Summit! Dynamics has a vibrant global and local independent user group network, with groups to focus on each of the different Dynamics product sets. The annual global summits are all held at the same time and are highly popular. The event is focused around learning (interactive sessions offer valuable content for all Dynamics users, no matter your product version or experience level) and networking (benefit from the real-world expertise of others in your role, your industry, or with similar goals). 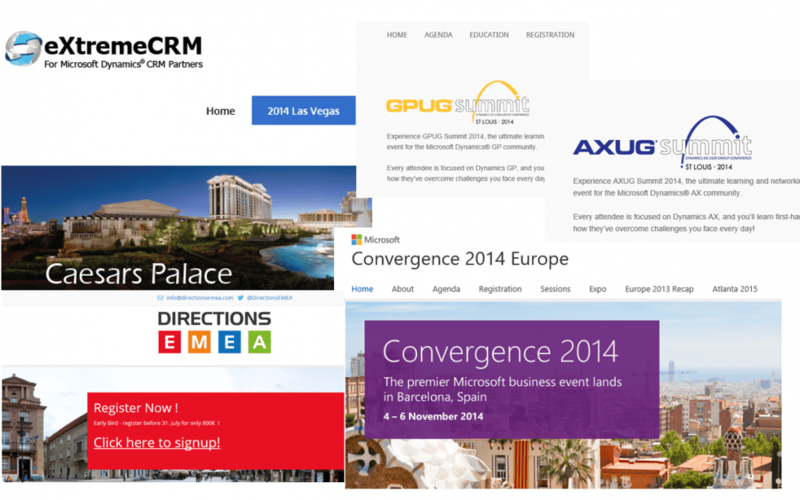 There are 4 summits in parallel – CRM, AX, NAV and GP. This is a Microsoft-run event aimed at Dynamics end-users based in Europe. This is an annual conference and Microsoft fly in many key execs from Redmond as well as the local European offices. It is a great opportunity to network with Microsoft, other end-users and partners, as well as learn about the product-centric view of the latest releases, the top strategies and the road ahead for our key Microsoft solutions. There are multiple product specific tracks and product sessions. Hard to choose, isn’t it? If you can’t attend all of them pick at least one event based on the event audience, your product focus and location. If you find this article useful, please share it with colleagues and other contacts of yours. The more people attend these events, the better the networking experience, so everyone wins! About us: 365 Freelance is an online platform that gives Dynamics partners and end-users instant access to hundreds of contractors, as a membership community rather than a recruiter. With a network spanning 66 countries, it allows companies to search for freelancers based on their required skills, rates and available dates, enabling them to find the best person for their projects without incurring the hefty fees typical of recruitment agencies. Register here – www.365freelance.com.